The Friends of the Bratch regret that the Summer steaming has been cancelled. The next scheduled steaming is due to take place Christmas 2010, see the Diary page. The next scheduled steaming is due to take place in December 2010, see the Diary page. The Grade 2* Bratch Pumping Station at Wombourne is one of only 50 remaining steam pumping stations in England. Built in 1895 by Bilston Corporation, it comprises a wonderful Gothic style “fairy castle” pumphouse, within which are two huge vertical triple expansion steam engines. These were used for 65 years to raise pure drinking water from deep boreholes, and pump it to a purpose built reservoir in Wolverhampton. The steam engines were replaced by electric pumps in 1960, and fell into disrepair, but in 1991 Severn Trent Water commissioned a major refurbishment of the building and of one of the engines, Victoria. 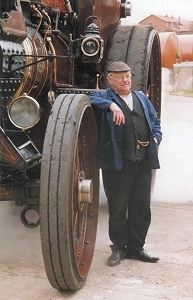 The restoration to full working order was undertaken over a period of 5 years by the well-known Wolverhampton steam engineer Len Crane, together with a small team of enthusiasts. The engines are steamed for open days and galas two or three times a year by Len with the assistance of the Friends of The Bratch.